AI dismissed waypoint needs attention I think. There are still some issues with the AI, especially the one I tested today and it is still present. If you place yourself on hill and place AI OPFOR soldier on the opposite hill and start shooting on him, he will just lay down, looks like he is looking for you, but he is not able to spot you, so he just stand up and thats it. I must note that I tested this with max. skill and with Enemy AI on 1.00. If there was a human player there instead of the AI, he would definitely see me, since I was not hiding behind anything. To me, it looks like the AI is having problems with enemies that are far away and it is not able to detect them. If there was a human player there instead of the AI, he would definitely see me, since I was not hiding behind anything. And even if he wouldn't spot you, he would at very least fire shots in the direction (he thinks) your shooting from. I would like to talk about the Driving AI. But most of the times, vehicles navigate pretty good now...except for the tanks. In all previous ArmA titles if you set them on careless they would follow roads nicely...in ArmA3 it makes no difference if you set them on stealth, danger, careless...all the tank drivers drive like they are in a real hurry and drunk as hell. Really, really great to see so much going on with the AI! One issue that is particularly annoying to stealth missions is this one on the issue tracker. 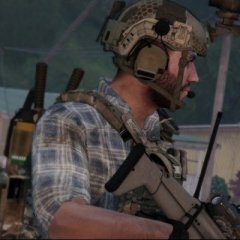 Basically, AI knows about group members that are killed immediately, without being able to see them. Sorry to go slightly off-topic on A3, but will/are these changes if not already being implemented (where possible) in A2/A2:OA? Added a repro case to the bug report. Note that the behavior persists even if the enemy units do not have radios (I "removeAllItems this" from them). EDIT: Added another repro case. This time second guy is on the Kamino firing range, with a PiP Live Feed to the player. No radios, but still the AI knows that their partner got shot. Laid up in long grass maybe? Even if you have grass switched off the area you are on will still use the config to determine how well hidden you are. Might explain why he could not see you at all. +1. Credit where credit's due. Good job BIS dev team. Keep up the good work. Nope. I even tried to run around, shoot on him while running around and he was just not able to see me. It seems the type of the enemy also affects wether or not they are able to spot you. I used a rifleman on hill 86 between the OP and the Farm near Stratis Airfield, and placed myself as an opfor Rifleman (with an ARCO instead of ACO, so I could see if I hit) on hill 59 east of the petrol station. The blufor rifleman was not able to spot me even when I hit him multiple times. When I used an autorifleman, he turned towards me and did not get up again as the rifleman did, but he also did not open fire. I tried to use both rifleman and marksman and none of them opened fire. There are still some issues with the AI, especially the one I tested today and it is still present. To me, it looks like the AI is having problems with enemies that are far away and it is not able to detect them. I don't think that is an issue. AI can detect you if you shoot at them, but won't shoot back if there is no chance to hit you, what ever their skill levels are. If they have scopes, they can hit you and shoot back. Machine gunner may shoot back also, he has more ammo to waste. Grenadier may also try, but with no luck, usually. If you are about 400 meters or more away from a group with no scopes, you are safe. They may know where you are if you are shooting at them, but aren't able to fight back. A group usually stays low if they are shot at from far, but if they are hit and start having losses, they'll flee or try to flank, or both. Tried with marksman, 700+ meters is too much for marksman. At 600-700 meters he shoots back. A sniper will shoot back if shot even 1 km away. AI at long distances seems fine, I don't think there is much need of fixing here. ItÂ´s really basic, just one unit vs one unit. It also shows that bullets flying past the enemy do not alert him, only nearby bullet impacts do. It is realistic that he doesnÂ´t immediately turn towards you, however, he should at least try to find cover (there are buildings and walls nearby) and/or fire in the general direction of the incoming fire. For a rifleman, 500 meters is just too much, sniper or squad leader/marksman do return fire. Sniper is quite effective, too. I noticed that if there was a squad leader or marksman in the group and a couple of autoriflemen, autoriflemen would be more eager to shoot back and are a lot more effective too, as there is someone in the group to actually see you and pinpoint your location. If there were only a couple of autoriflemen and few riflemen, they may shoot only few shots in the general direction of the incoming fire. Maybe far away enemy Could react for bullets flying towards them earlier, but at least they react when bullets starts getting close. Overall, AI seems to be working well. matches what I have seen. I sniped against an infantry group from about 500m. The only unit who tried to engage me was the AT soldier who used his launcher and took out my spotter. The others looked and aimed but did not fire. likely that they knew that their reach was not long enough. I now have a big smile on my face seeing these AI improvements. IMHO I would do with a lower amount of units/vehicles etc and with all the time that that frees up, pumping it into AI improvements. However, I have, and always will trust BIS to give us the best they can ... that's why I'm a supporter! "Helicopters pilots prefer not to crash to trees and hills - but reserve the right to do so"
Probably out of weapon range. Hladik: I am very happy to see that your focusing on AI like this. There are one issue I'd like to hear your thoughts on, as it's easily one of the most important for me. AI, both friendly and opfor can't be forced to run while attacking or fleeing. I have hated how, as a commander, I can never get my AI to run without buddy jumping while engageing either when retreating or when engageing. I would love it if the AI could be better at breaking contact and starting to run if I tell them to. Any thoughts on this? What I was hoping for rather was him attempting to take cover, primarily. Only when used as a team and with their team leader killed will the AI start to move, it appears. Refer to the bullet points at the beginning of the document (page 2) as well as Tests 05 and 06. The most casualties were units shot out of cover or when not exploiting cover well, even in all other tests. 05 and 06 were just the most egregious examples of the AI charging headlessly into enemy fire. I think them not exploiting cover as well as players is not a major problem, because itÂ´s too complicated to make them use the sidestep and different levels of ducking, but they should at least prefer to hide away from the enemy rather than standing upright in the middle of a driveway, blazing away over the heads of prone enemies. Another thing is their first round accuracy and them missing all successive rounds. I am also thinking about how to simulate covering, suppressive and area fire for the AI, since right now they only appear to understand distinct point targets. 90% of the time you do not see your enemy clearly in real life, at the start of an engagement or at large range, so you give area fire rather than point fire. I refer to the videos Dslyexci posts on his channel, from the shacktac sessions. Players in contact who do not see the enemy will rather blaze away in the general direction of the enemy until a clear target presents itself. The AI, conversely, appear to only shoot at observed point targets (individual enemies.). Can you confirm any of this, or are we just not seeing the behaviour that is intended due to the configuration not being adjusted yet?